For five consecutive years, three Nigerian states took an unmistakable lead in university admissions into courses leading to the award of degrees in Engineering, a PREMIUM TIMES analysis shows. The states are Oyo, Ogun and Osun. 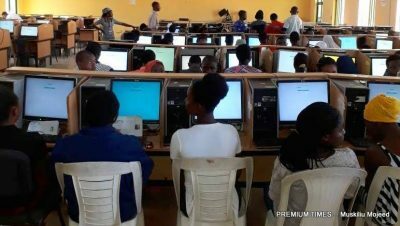 More than the other 33 states and the Federal Capital Territory, Abuja, the three states, in varied sequence, maintained a consistent lead in JAMB-administered admissions for Engineering courses in 2011, 2012, 2013, 2014 and 2015, the analysis based on data from the Joint Admissions and Matriculation Board(JAMB) shows. The data were verified by the National Bureau of Statistics. The three states were closely followed by Delta, Ondo, Imo, Enugu, Akwa Ibom, Kogi, and Kwara states. Some states in the second category broke into the first three in some years, while in other years, they missed out entirely from the top eight. Edo made the top eight states twice, while Kaduna and Benue made the best eight once, each. The data are for students admitted through test-based examinations conducted by JAMB. JAMB’s admission process is guided by merit, university catchment area and gives advantage to educationally-less developed states. The analysis follows a similar evaluation by this newspaper of admissions into Medicine. A future assessment will focus on Law – the three being some of the most competitive university programmes in the country. As the Medicine report, which showed a largely regional trend with South-East states of Imo, Enugu, Anambra and a South-south state, Delta, taking the lead, the latest analysis on Engineering shows mostly South-west states in top positions. The JAMB data show that in 2011, while Osun had 1,196 students admitted into various universities to study Engineering degree courses, Ogun followed with 1,117 students with Oyo coming third with 1,076. Delta came fourth with 883 and Benue was fifth with 847 students. 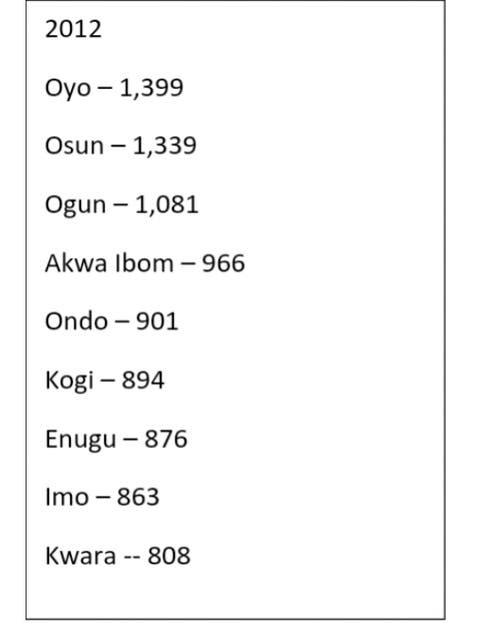 In 2012, Oyo emerged first with 1, 339 students, Osun followed with 1,339 and Ogun came third with 1,081. Akwa Ibom was fourth with 966. Ondo placed fifth with 901 students admitted into Engineering. 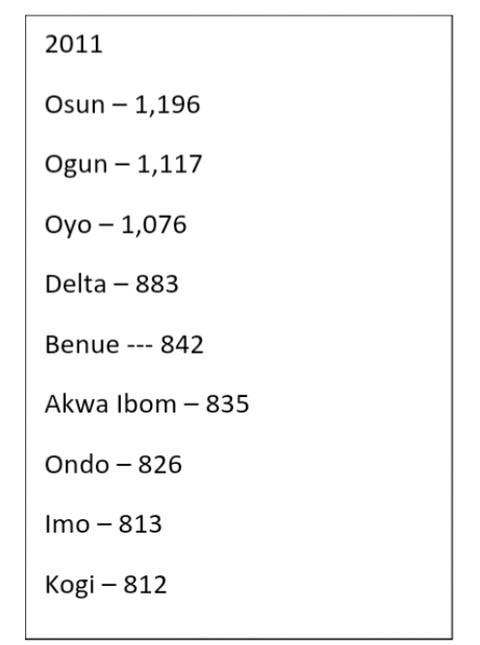 Oyo led again in 2013 with 1,870 students, while Osun followed with 1,478 and Ogun came third with 1,244. Delta came fourth with 1,165. Fifth position was taken by Kaduna with 1,068 students. 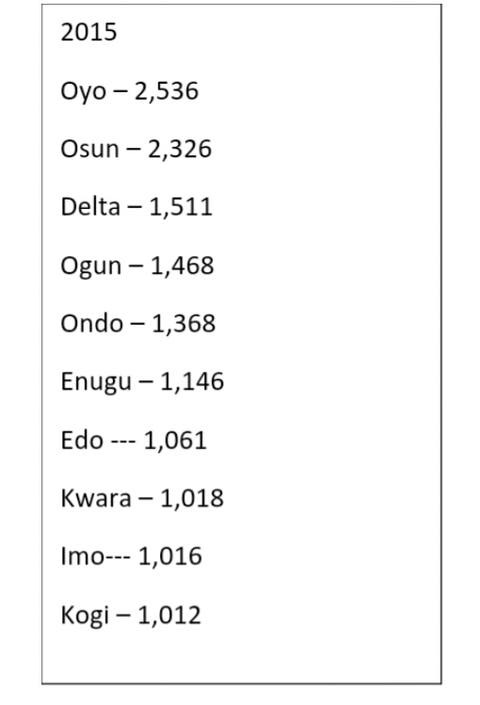 In 2014, Osun returned to the first position with 2,168 students, with Oyo dropping to second with 1,647. Ogun came third with 1, 639; Delta was fourth with 1,447 and Ondo with 1,281, took fifth. 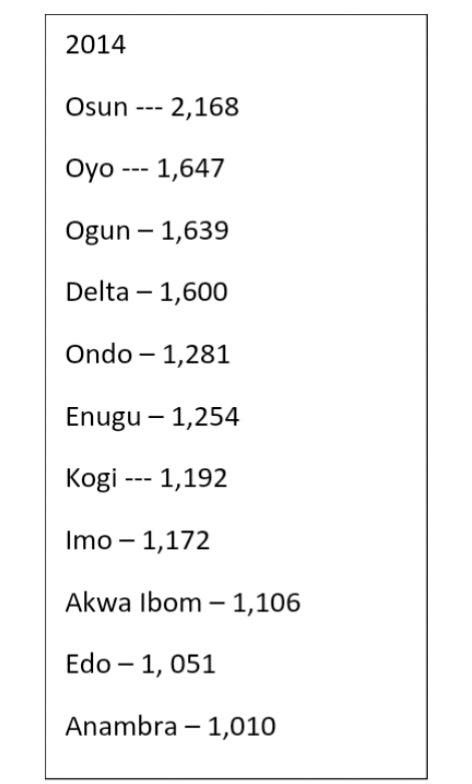 In 2015, Oyo reclaimed the first position with 2,536 students, Osun followed with 2,326, Delta came to third with 1, 511, while Ogun was relegated to the fourth position with 1, 468. Ondo maintained the fifth position with 1, 368. 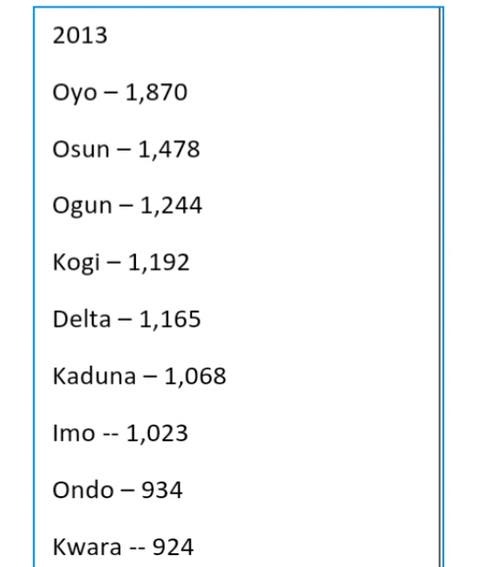 States at the bottom of the admission table were FCT, Yobe, Zamfara, and Sokoto. Other states that had poor showing in Engineering admission were Bayelsa, Borno, Nassarawa, Gombe and Cross River. Sokoto had 19 students admitted into Engineering in 2011, while the FCT had 28 students. The trend was similar for the five years. In 2012, Yobe had 44 students, followed by Zamfara with 77 students, Sokoto with 93 students and Borno had 99 students. In 2013, Sokoto had 60 students, followed by Zamfara with 126 students. Yobe had 162 students while Gombe had 247 students. In 2014, Sokoto had 88 students, Bayelsa had 188 students, Nassarawa had 199 while Gombe had 221 students. Also in 2015, Zamfara recorded 135 students who got admission, Bayelsa had 137 students, Sokoto had 174 while Cross Rivers had 228 students. John Umaru, a retired permanent secretary at the Kogi State Ministry of Education, said the admission pattern reflects the availability of resources to improve science and technology in some states. He said state governments must endeavour to understudy the top states and imbibe “what they are doing right”. “State should be allowed to do comparative studies or analysis so that they can replicate what the top states with the high number of students studying engineering are doing for the past years,” he said. He said the country will not be able to detect the peculiar problem of a state if the government fails to “compare notes” with the states that are doing well in different sectors. “Until we start comparing notes across the country, we won’t be able to know the peculiar problem of a state and adopt what others are doing right so that the performance of our students can improve,” he said. “If you take a look at the mathematics quiz organised by Cowbell Milk, the students that scored well are from Ogun, Osun, Oyo, Lagos and Anambra States. Some of these students are from well-established private schools, but how many private schools can we boast of in Yobe and Zamfara States,” he asked. Mr. Umar said the problem in science education is with the foundation. “How grounded are these students in primary science, basic level of education? If the foundation is not strong, there will be a serious issue. Yobe State have been noted for backwardness in education,” he said. According to him, the pattern also reflects the decline in infrastructure, facilities and quality of teachers in schools. He said teachers’ training programme must be re-addressed. “If there are no qualified teachers to teach the students the basics, how do we want them to comprehend what is being taught? How do we expect them to pass common entrance well, let alone the science subjects in JAMB. These students needs basic knowledge in Physics, Chemistry, Mathematics and Biology,” he said. He added that the attitude of parents towards their wards’ education also contributes largely to their success or failure. Finally, he also noted that poor attitude of students to their education is a common phenomenon that should be discouraged.